← Following my own advice–not! I’ve made a list of those states among the fifty United States that I have never visited, and in the rest of my life I’m going to try to visit them all. Alaska and Rhode Island have lots of appeal, worth a journey. I wouldn’t choose to make a special trip to visit North Dakota, but when we were driving home after our daughter Judy’s big cross-country bicycle trip, it seemed an opportunity to cross an un-visited state off the list. We decided we should spend some time in North Dakota. North Dakota is a prairie state, with lush green and yellow fields going on for miles and miles and not a whole lot else to see. 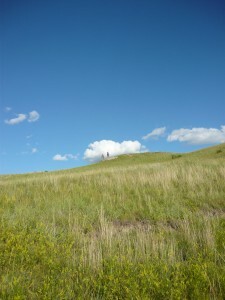 (If you look very closely at the picture of the prairie, you can see Judy and Goldie standing at the top of a hill, outlined by a cloud.) In the western part near the town of Medora the terrain changes, becomes channeled and broken, with steep banks of little streams cutting through the rolling hills. This is a tourist area, with the town of Medora itself and some of the prairie set aside as a national park, Theodore Roosevelt National Park. That’s where we headed. Among the attractions of Theodore Roosevelt National Park of course there’s the history: Roosevelt came to the Dakota territories to shoot bison and went on to become an ardent conservationist of animals, water, and other natural resources. Our daughter, a graduate of Roosevelt High School, learned why her yearbook was called “Strenuous Life” (it’s the name of one of T.R.’s books); she already knew why her teams were called “Rough Riders.” A ranger led us through the cabin that the 26th president occupied when he was a rancher in the area, and we learned that the Maltese Cross ranch that T.R. owned is now the northern half of the park. That was our second day in the park. On the first day, we were living the “strenuous life” on our own. Although Judy had packed the sag wagon for her bicycle trip with everything that up to four people might need to camp out, we had not yet had the opportunity to camp, so our first task in the park was to find a spot in a campground. When we first drove into the campground, there were two unsaddled, unbridled horses standing in the middle of the road, and we wondered why their riders had left them there. The camp host informed us that these were wild horses, that the park held herds of them as well as bison, and that they all had the run of the park, including the campground. When we found an unoccupied camp site and started to set up camp, we found clear evidence that the horses had visited. After we had set up our two tents, we drove the scenic loop around the park, taking short walks to vistas, spotting more wild horses, a large herd of bison, and several prairie dog “towns.” We returned to our camp site ready for a hot dinner, but our stove wouldn’t work. We dined on cold lunch foods, and started out the next morning with no coffee! Cold breakfast, no coffee, followed by a hike across the “Bad Lands,” which weren’t bad at all unless you wanted to be a farmer. For a cattle rancher, the badlands would be just fine, with lots of green stuff for cattle to graze on and little streams where they could drink. We followed a trail called “Jones Creek Trail” which crossed back and forth over the creek several times, and went all the way from side of the loop road to the other. We earned a trip into town on that hike, and feasted on huge “bison burgers” with coffee at a very nice restaurant. Medora is a very popular tourist town, with a famous theatre and other attractions and lots of shops. In one of them we found a part that could fix the broken camp stove. We spent the rest of the afternoon in the air conditioned park headquarters learning about Theodore Roosevelt, and went back to a hot supper. Judy had packed camping gear for four, so I had two mattresses for myself, and I crawled into my sleeping bag prepared for a comfortable night. Hot supper, warm and soft bed–what more could a camper wish for? In the middle of the night, it began to rain. Not an ordinary, gentle Seattle-type rain. This was a deluge, with lightning and thunder that went on and on and on. The whole inside of our tent lit up with each bolt of lightning. With my eyes closed, I saw red with each flash. It must have lasted more than an hour. In the morning we crawled out of our sopping tents. We knew it would take them a long time to dry, so we left them. We drove into town again, and stood in line for breakfast at the only restaurant that seemed to be open so early. Hot coffee and French toast. Back in camp, we packed up the wet tents as best we could and left North Dakota for ever. 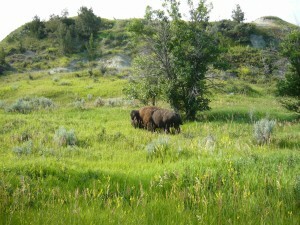 This entry was posted in Camping and Hiking Equipment, Camping and Hiking Tips, Family, Food, Hiking, Travel and tagged North Dakota, Theodore Roosevelt National Park. Bookmark the permalink.